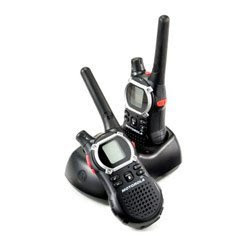 Our July Give-Away is ONE PAIR of these radios. You can enter by adding a new Comment to any 2010 JCO post. One comment per post, but multiple entries are allowed (multiple posts). Be sure your contact info is available via your link or comment text. Winner will be chosen at random from all entries, and will be notified via email. No purchase required. Odds improved by making multiple entries, as noted above. 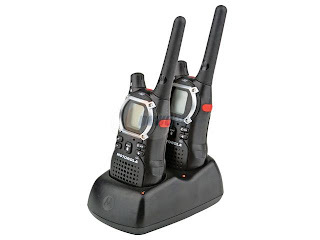 JCO does not provide any warranty for this product, and Motorola is NOT a sponsor of this give-away. Deadline for entries is July 31, 2010 EDT. Why bother camping at all? Everything about Home seems better -- certainly the facilities, right? And there's bugs, and mud, and it always rains. So what's the point? Why would anyone want to pay for the privilege of roughing it? And yet, every good-weather weekend, wherever you live, thousands of people head off with tents or campers, even motor homes, to find a spot (secluded or otherwise) so they can go camping. Anyplace but home will do. Here are ten reasons why we go camping, and why you might like it, too. A change of scenery. Sometimes that's enough. No-four-walls is even better. To commune with Nature -- because for whatever reason, we almost never think of doing that, otherwise. The sound of raindrops on canvas, or the beauty of a few million stars in a pitch-black sky; priceless. To hang out with our friends and family somewhere else, where none of us is the "host," yet we are all still gathered together. Who washes the dishes? Maybe you can flip for it. To leave the TV off. The best way to do this is to remove the option to turn it on in the first place. Camping is great for that! Radios are okay, but not too loud. That's the rule. To get away from all the ordinary crap that clutters our daily lives at home. All those to-do lists and chores will still be there when you get back. Forget them for a few days or a week. Chop some firewood instead; it's good for you. To force our kids to spend time with us. For many of us, you have to remove A LOT of options from the kids in order to make "time with the parents" appealing. Little do they know, we're pretty good company when you give us a chance. Hey, remember "board games"? Yeah, those are cool. So we can have campfires and roast marshmallows. Two great things you never get to do at home! Why can't we have campfires at home? Good question, isn't it? Camping gives up permission to sit in chairs and just hang out, alone with a book or in a ring of seats with 20 friends around a big fire -- it's all good. Maybe there are hiking trails, or fishing ponds, or horseshoes, or a big pool, or paddleboats, or fireflies, or playgrounds, or group bingo, maybe even karaoke. You won't find most of those at home, will you? Reason #10 should be a big one, right? There must be ONE totally awesome most compelling reason to go camping. "Because we hate hotels and they are expensive." How's that? I'll bet there are dozens of other great reasons we love to go camping. What's your #10? Want to share a great camping experience? Ask me about a possible guest post. Camping tips: Take your kayak! One of the things I love about kayaking is the opportunity it affords me to escape into nature, away from motorboats, away from throngs of people, and away from man-made noise. By combining camping and kayaking you can extend the escape and submerse yourself in nature. Some wonderful opportunities for these escapes exist in the Finger Lakes region. But first, camping needs to be sub-divided into two distinct experiences. The first is the use of campgrounds where you can set up a tent or use a camper and enjoy the luxury of a shower after a day of paddling. As drawbacks, you won’t escape the noise and throngs of people and there is a cost involved. Primitive camping, on the other hand, is free and offers solitude and quiet, but you have to be willing to forgo showers and flush toilets. You choose. Camp at Park Station Recreation Center and paddle Park Station Lake. 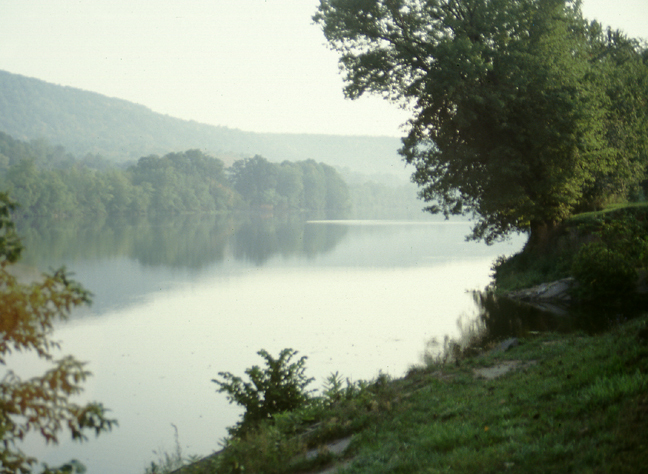 Park Station Recreation Center in Erin offers 6 miles of hiking trails, a RV and tent campground, and a 100-acre man-made lake to paddle or fish. Become an explorer on a 21 mile loop using the Erie Canal and Clyde River and camp along the shore in the Galen Marsh Wildlife Management Area. A true sense of adventure is helpful for this trip. 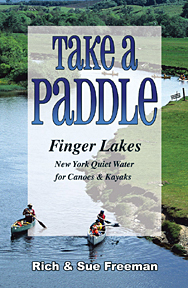 If you love the outdoors, and especially if you're a devoted kayaker, you'll love the New York Outdoors Blog. Content is updated daily, and there's rarely a dull moment. Subscribe today! 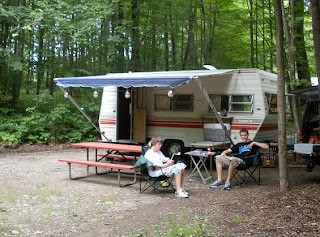 Down by the winding banks of the Canandaigua Outlet, in a lush little valley east of Phelps NY, lies a pleasant family-owned camping resort named, appropriately, Cheerful Valley Campground. It's a twisty, grassy, shady glen filled with big trees and a wonderful variety of campsites. Located just off the New York State Thruway near Exit 42 and centered between Lyons, Geneva and Waterloo -- Cheerful Valley attracts visitors from all over the United States. Campers will find everything from swimming and fishing, to horseshoes and volleyball, to music and movies in this quiet rural getaway. Carl and Peg Carlson, 2nd-generation owners, took over day-to-day management about five years ago. They've been adding improvements ever since. This year, we found a brand new round-log play area next to the newly renovated pool. Utilities have been upgraded, and the grounds look fantastic. 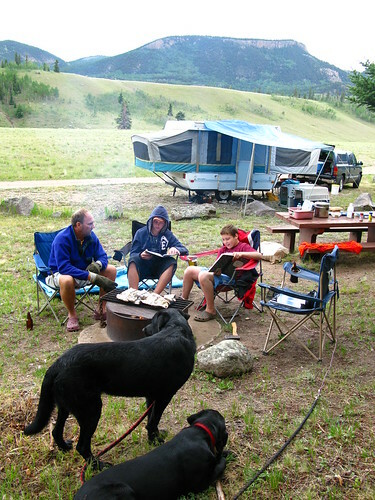 About one third of the more than 150 campsites are rented full-time by campers who take very good care of their sites. Plenty of open lots await weekend and vacation visitors. There's room for no-hook-up tenters, pull-through motor homes, pop-ups and trailers, and plenty of choices for larger groups (with advance reservations). Cheerful Valley even includes two rental cabins situated between the main office and the pool area. The terrain varies from hilly or terraced to shady meadow, and from somewhat secluded to open and festive. 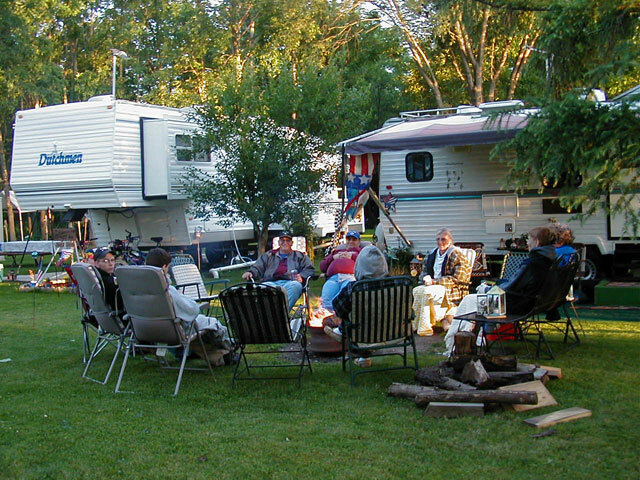 A range of full-service sites are scattered throughout the campground, so that campers aren't confined to specific areas dictated by their choice of accommodations. Two sets of modern restrooms and hot showers are provided. Reprinted from the original hosted on Helium. Copyright 2010 -- Jim Bessey, all rights reserved. Reprints available. Where have you been? 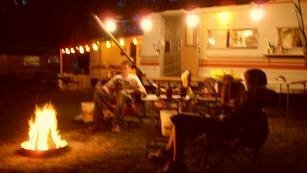 If you've recently stayed at a campground you liked -- or even one that disappointed you -- we'd love to host your review. Contact me for more information. Not a subscriber to blog.RV.Net yet? If you own a recreational vehicle, this magazine provides a wealth of information on a wide variety of topics for the RV camping crowd. If your dog is good and healthy and raring to go, that's great. Now you'll have to make sure to accommodate his every need, just like you do at home. Be sure to pack plenty of his favorite food and treats in zip lock bags to keep them fresh and dry. Also pack his food dishes and a couple favorite toys. Doggy will feel more at ease having his own things along. How about you? Do you have a camping article or true story you'd like to share? Guest authors are always welcome. If you'd like to submit your article for posting, you can reach me via Comments or by using the link at the top of this page. Why do we go camping? 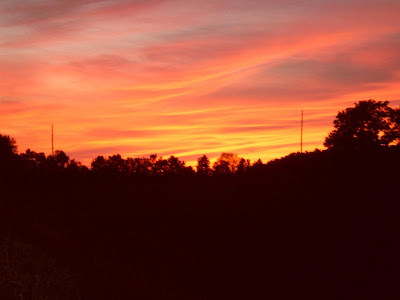 So we don't miss sunsets like this one! When we go camping we leave the TV behind, and usually find ourselves outdoors looking westward at sunset. The final sixty minutes before the sun goes down are known as "the golden hour" by photographers -- a time when the light is muted but somehow magical. Almost-sundown provides ideal conditions for taking picture, not to mention relaxing with your loved ones, a cold drink, and the beginnings of a campfire. If you have Camping pictures you'd like to share, please contact me via Comments or by using the link at the top of this page. You can also find me on Facebook if you prefer. Towing safety begins in your driveway. Other than driving in a blizzard or hurricane, pulling a camper trailer down the highway is one of the most dangerous things you can do with your tow vehicle. On the other hand, what's better than being on the open road, with your living quarters on wheels? With sound attention to detail and a reasonable level of caution, you can safely haul your family camping trailer down the highway for a memorable vacation. Make it a habit to go over your camping rig with a safety checklist before you hit the road. There's a lot riding on your tires. You've heard the expression, "kick the tires before you go," right? That's a great place to start. Proper inflation for all eight tires (at least!) on your tow vehicle and your travel trailer is critical. Use the high-end of your tires' listed cold pressure numbers for good-weather hauling. All four trailer tires should have identical readings. You can use a mid- to low-range setting for your vehicle's front tires to ensure smooth handling. Visually inspect all tread surfaces for unusual wear while your adjusting tire pressures, too. Never needlessly risk a blow-out on the highway! Look for trouble before you hitch up your wagon. Two sure warning signs of trouble are rust and frayed wires. A rusty hitch could be dangerously weakened. Use a wire-brush and good lighting for a closer look. See any cracks? If you have any doubt about your hitch's integrity, have it checked by a qualified shop. Replacing a damaged hitch component is a minor inconvenience compared to the potential consequences. If all you're seeing is surface rust, brush it clean then prime and repaint. If your safety chains are badly rusted, consider installing a new set - a small investment that looks good. Take a minute to lubricate moving and load-bearing parts, too. Make good connections. Hook it up and check it out. Nothing quite beats wonderful steak and eggs for breakfast when you are camping. With a steaming hot cup of coffee, this hearty meal gets you going for the camping day. The dish isn't even very difficult to prepare. The type of steak is entirely up to the camper. Pork, beef, venison, buffalo, and elk all taste fabulous. For best results, the steak should be 1/2 to 1 inch thick. The thinner it is, the faster it will cook, so if you like steaks cooked rare to medium, thicker cuts allow you to better control how done the meat will be. The heat should also be low. High heat can tend to overcook the outside while the inside is still blood rare. While this can be fine if you like very rare steak, cooking at cooler temperatures again allows you more control. Read the rest of Rex's guide to cooking steak and eggs on Helium.com. If you're a steak lover, you might also like to learn about Grill Charms™ -- a simple yet elegant way to mark your steaks during cooking, developed by Leslie Haywood of Charmed Life Products LLC. I love reprinting great articles from my friends at Helium. I also accept original submissions on any Camping theme, as well as your Camping pictures. Guest authors always receive full credit and generous links, and are chosen based upon the quality of their work. If you'd like to be included here at Just Camping Out, you can reach me via Comments or by using the link at the top of this page. Find me on Facebook, too, if you prefer.